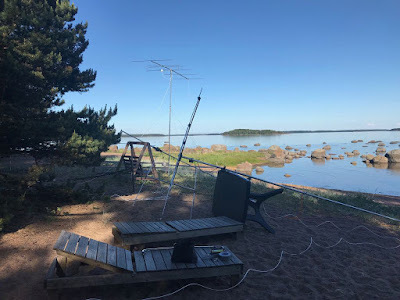 Both DX-camps are over 17.6.2018 - in Utö and in Virolahti. The DX-results were catastrophic. 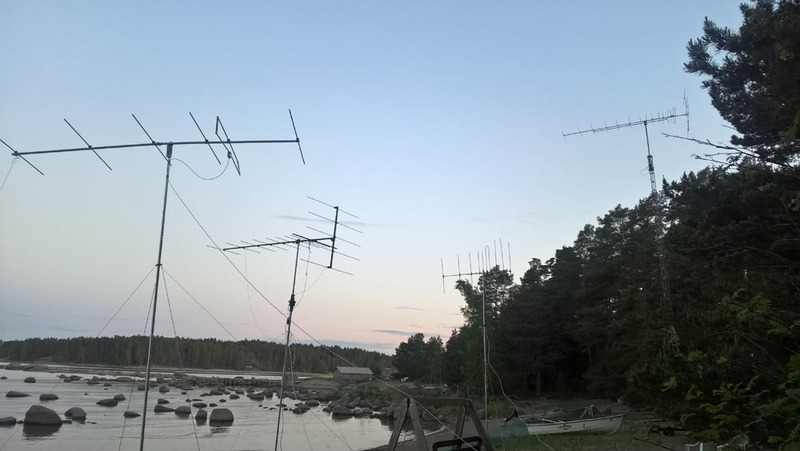 Results in Utö: A few openings for about 6-8 h time fading in and out in the lower band - and MUF only briefly over 100 MHz. The opening areas were mostly to South France and South Italy. Only year 2011 has been worse. The annual card-game winner was JJS, beating JTK with 2 points. Results in Virolahti: Very poor Es-conditions. Opening time only for 3 hours (Turkey, Russia, C-Europe). Both camps will return next year in the beginning of June. 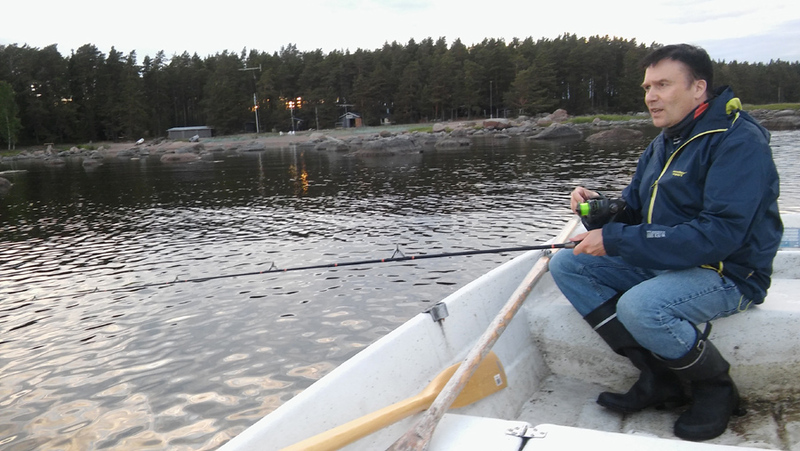 Last full day in Utö2018-pedition was silent. Last 10 days have been been very poor for FM-DXing in Finland. 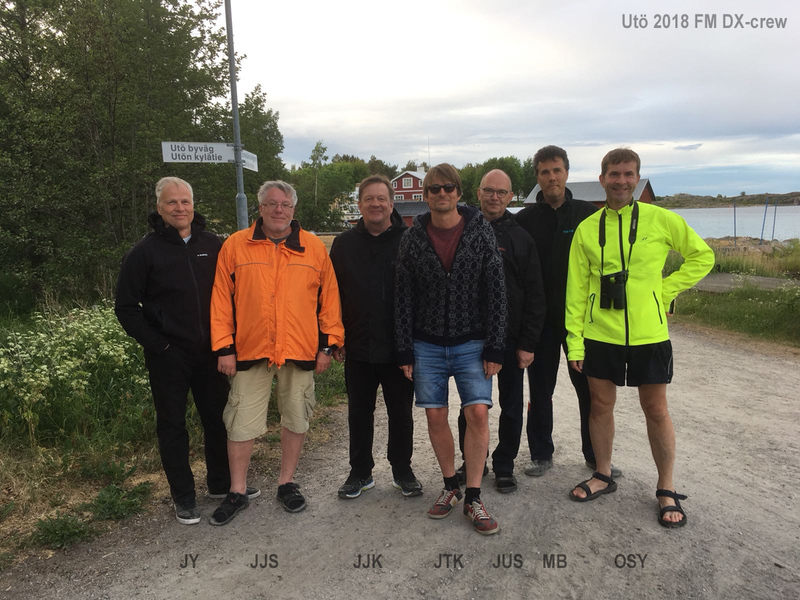 Utö2018 will be closed tomorrow morning. Trying to conjure and motivate Es-conds up with gifts for Essi! The Sporadic E-condtions have been catastrophicly poor and weak in the beginning of June in Finland. 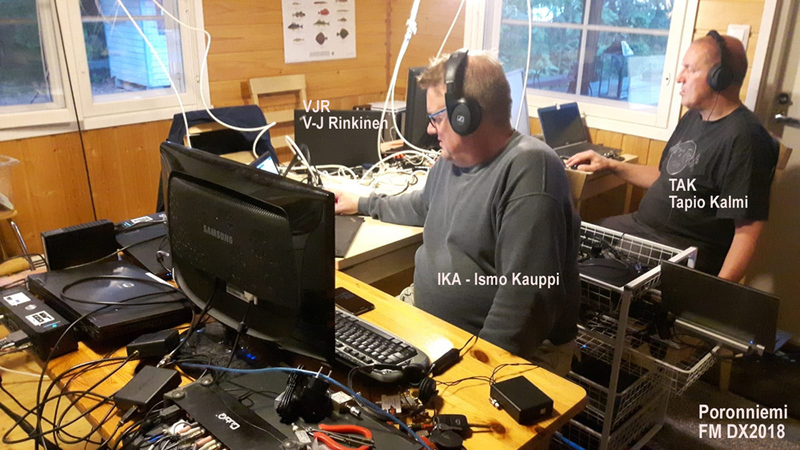 During two traditional FM DX-camps there have been openings only a few hours time. 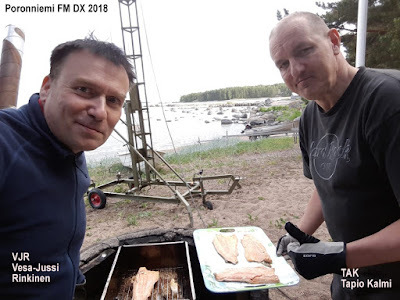 Nothing to DX on the FM-band! 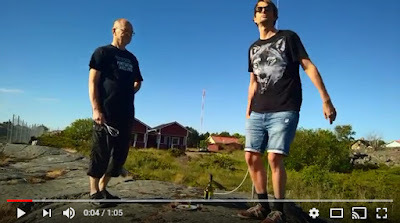 DX-crew in Utö tried to conjure and motivate Sporadic E out with a well prepared ritual for Essi (the Goddess of Sporadic E). This action with gifts was made in Wednesday - but unfortunately it did not work! Utö observations 15.6: Shortly weak Italy-opening (AL,GE) for 10 minutes and also ALG Radio Soummam 88.7 briefly. Poron2-DX-camp unloaded and closed today around midday. The results of this camp were very poor. Totally there were three hours Sporadic E-conds: 15 min Turkey, 2 h Russia and 40 min (C-Europe). Utö2018 continues till Sunday midday. 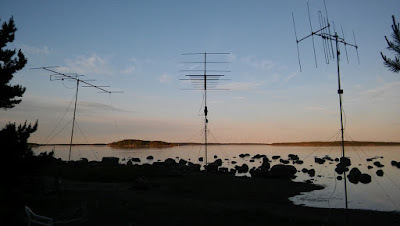 Utö observations 14.6: Some good signals in the morning from Russia on OIRT and it peaks shortly on 87.5 MHz to Russia. But after that DX-silence continues. On Wednesday total DX-silence in Utö and Virolahti continues... looks bad...One full day left in Virolahti-camp. 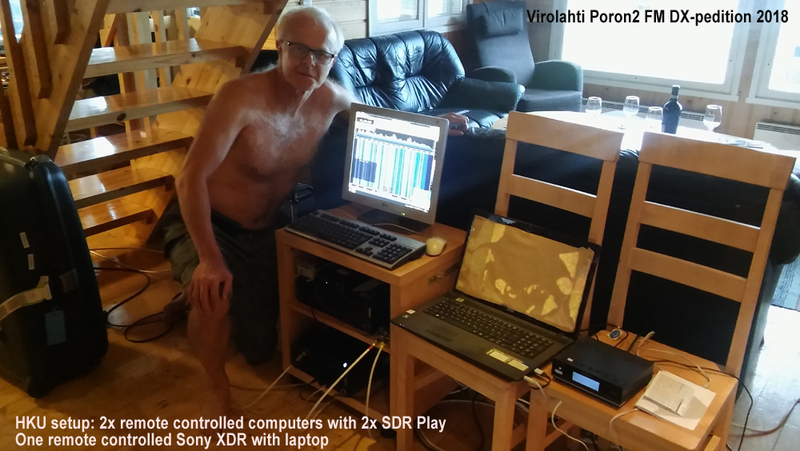 Total DX-silence on FM-band in Utö and Virolahti. 2nd day in a row. We made some tests by comparing Körner yagis at 6 meters (Körner 15.11) vs. at 12 meters (Körner 19.3) high above the ground (=sea level). There were no big difference between these 2x and 4x wavelength heights. 12 m gave slightly better signals when tuning semi-tropo-stations from South-direction, but with not so big boost. 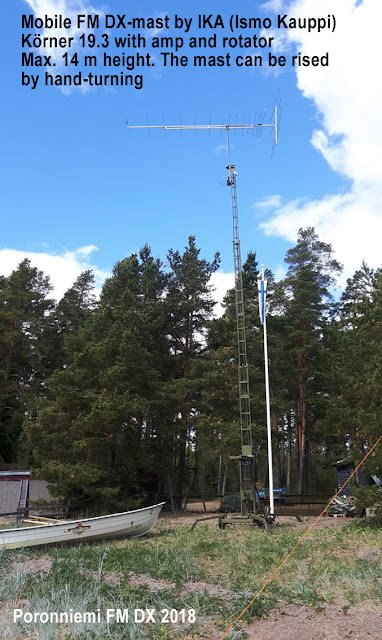 At the same time 12 m height also gave stronger signals from local stations of the back and slightly blocked some useable frequencies. We expected to have bigger differencies from front (DX) and back (local interference). 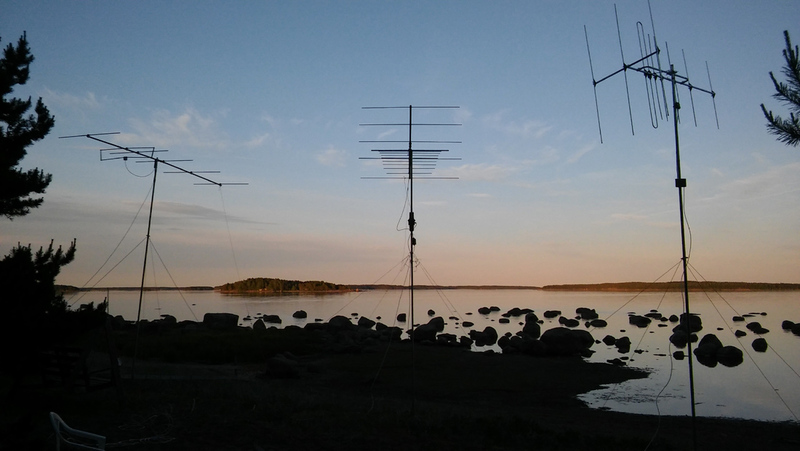 There might be bigger differencies when comparing these antennas during Sporadic E-opening. Everything is ready to make quick 6m/12m -comparison during Es with SDR Play PSR2 (Two antenna inputs). Let's hope to have that chance! Total silence in Utö and in Virolahti on Sunday. The photo at Sunday night (after sauna) in Virolahti FMDX. Silent and blank sea - and unfortunately the same on FM-band - blank and silent. 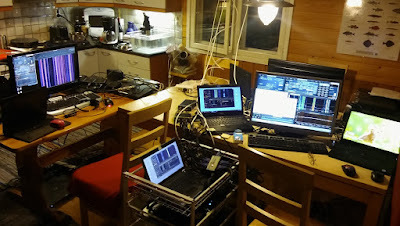 Kitchen is the heart of the DX-camp with dozens od PC's and rx's. Körner 19.3 HorIzonal with amp and rotator. Mast can be rised 14 m by handturning. 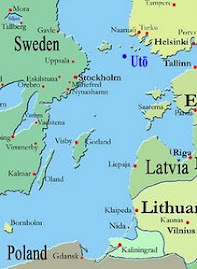 Utö observations 9.6: The late afternoon gave some Balkan-stations, maily Serbia and Bosnia and also Hungary. MUF slightly over 100 MHz. In the late evening there were opening to South Italy, like Brindisi, fading in and out. Virolahti observations 9.6: I the late afternoon an opening mainly to Austria,Slovenia and Italy lasting about 40 minutes. MUF shortly up to 108 MHz. Utö observations 8.6: Fair opening to South France (dep 30, 13, 11, 82 etc.) and also some northern France 01, 42 and several rapid Spanish- and Italy-bursts. Fading up and down for over two hours. 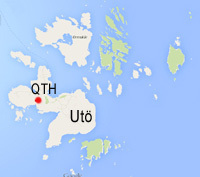 Utö observations 7.6: In the morning several Greek stations and also Romania, Bulgaria. Later also North Italy for some time. 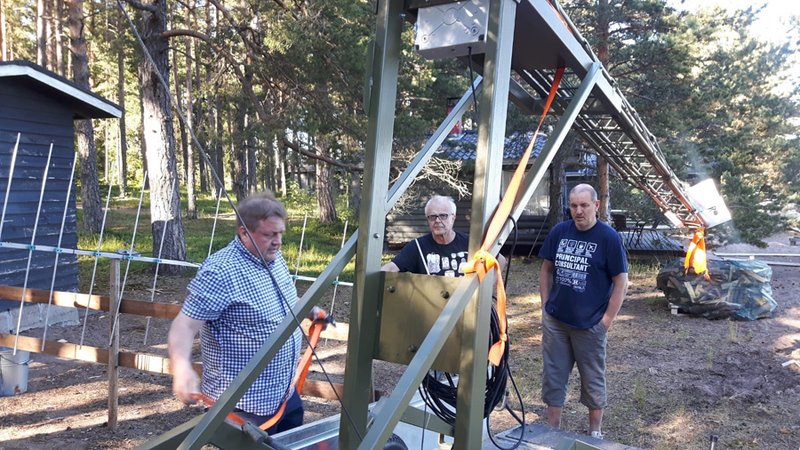 Virolahti observations 7.6: Very strong signals mainly from Russian Volgograd and Rostov-oblasts for almost one hour time. Later weak Ukraine and several arabs for 5 minutes. Here is a photo of the antennas in Virolahti Poron2-camp. 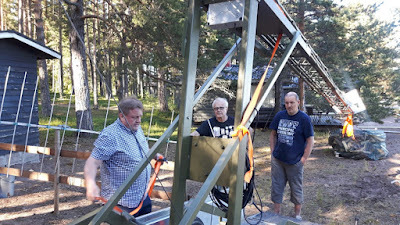 4) Antenna tower 12 m height with Körner 15.11 + amp. This mast can be rised by hand turning manually!! (This tower is owned by Ismo Kauppi). A little tilt-adjustment still needed. (Click the photo for better view). 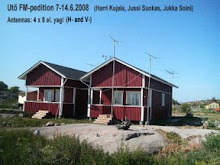 Utö FM-DX is blog for FM-DX-peditions in Utö-island in SW-Finland. 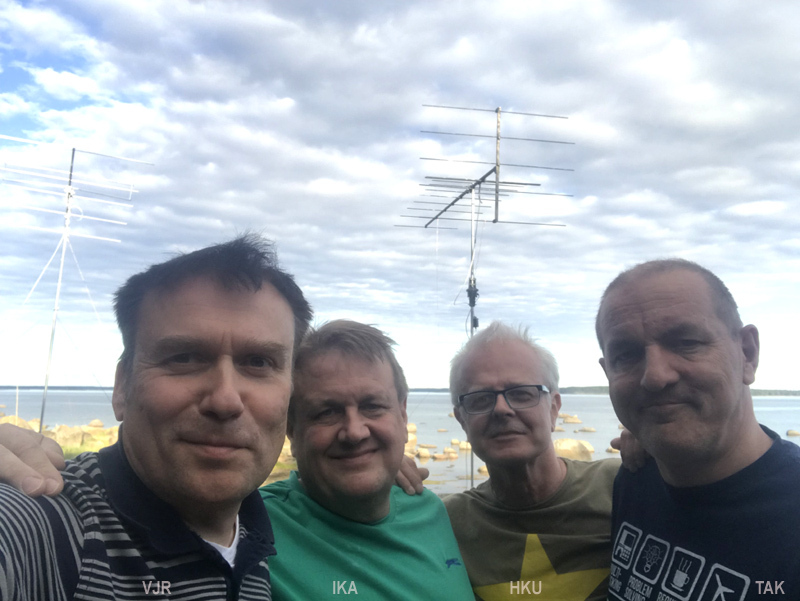 The listeners are Harri Kujala (HKU), Jussi Suokas (JUS) and Jukka Soini (JJS), Jukka Kotovirta (JTK), Marko Brask (MB) and Otso Ylönen (OSY), JJK (Jari Korhonen), JY (Juha Ylönen). 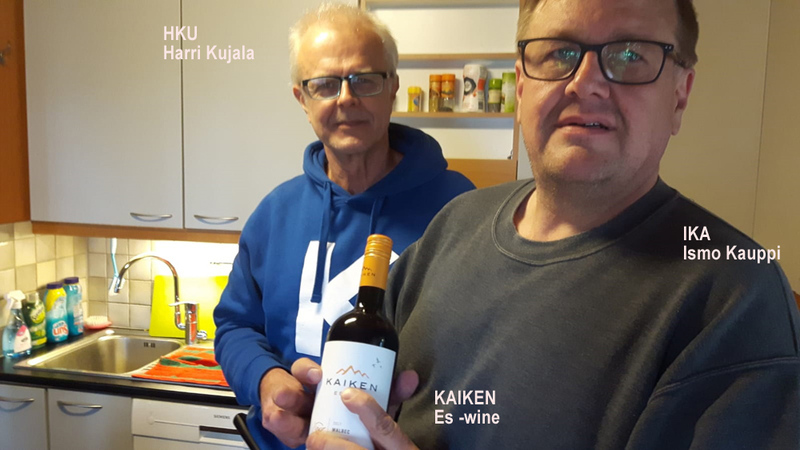 All from different parts of Finland.